Objective Women with a history of gestational diabetes mellitus (GDM) have an elevated risk of ultimately developing pre-diabetes and diabetes later in life. They also have an increased prevalence of fatty liver, but recent studies have reported conflicting findings on whether hepatic fat affects their risk of pre-diabetes/diabetes. Thus, we sought to evaluate the associations of liver fat with glucose homeostasis and determinants thereof in women with and without recent gestational dysglycemia. Methods Two hundred and fifty-seven women underwent an antepartum oral glucose tolerance test (OGTT), which diagnosed 97 with GDM, 40 with gestational impaired glucose tolerance (GIGT), and 120 with normal glucose tolerance (NGT). At a mean of 4.8 years post partum, they underwent an OGTT (which revealed that 52 had progressed to pre-diabetes/diabetes) and hepatic ultrasound, on which liver fat was graded as none (n=164), mild (n=66), or moderate (n=27). Results Liver fat was more prevalent in women with previous GDM than in those with GIGT or NGT (p=0.009) and in women with current pre-diabetes/diabetes than in those without (p=0.0003). As the severity of liver fat increased, there was a progressive worsening of insulin sensitivity and beta-cell function, coupled with rising fasting and 2-hour glucose (all p<0.0001). On multiple linear regression analyses, moderate liver fat was independently associated with lower insulin sensitivity (p=0.0002) and higher 2-hour glucose (p=0.009). Moreover, moderate liver fat emerged as an independent predictor of pre-diabetes/diabetes (OR=3.66, 95% CI 1.1 to 12.5). Conclusion The higher prevalence of liver fat in women with previous GDM is associated with their increased risk of pre-diabetes/diabetes. Recent studies have yielded conflicting findings on whether hepatic fat relates to the risk of pre-diabetes/diabetes in women with a history of gestational diabetes. How might these results change the focus of research or clinica practice? Future studies should focus on the temporal relationship between liver fat and metabolic function in this patient population. In the past 15 years, several lines of evidence have linked fatty liver and type 2 diabetes (T2DM).1 First, patients with T2DM have higher hepatic fat content than age-matched, gender-matched, and weight-matched controls.2 Second, in large epidemiologic studies, liver enzymes such as alanine aminotransferase (ALT) and gamma-glutamyl transferase (GGT) have been shown to predict the subsequent development of T2DM, likely by reflecting hepatic fat content.3 4 The latter interpretation has been further supported by studies showing that the diagnosis of fatty liver on ultrasound may predict incident T2DM in middle-aged adults.4–6 Thus, the accumulation of fat in the liver holds implications for diabetic risk. Hyperglycemia in pregnancy identifies women who are at risk of progression to pre-diabetes and T2DM in the years thereafter.7 This risk is proportional to the degree of antepartum dysglycemia, being highest in women who have gestational diabetes mellitus (GDM), followed by those with milder gestational impaired glucose tolerance (GIGT).8 9 In this context, it is notable that recent studies have reported that women with a history of GDM have an increased prevalence of fatty liver disease, but have yielded conflicting findings on whether liver fat impacts their glucose tolerance.10–13 Notably, Forbes and colleagues11 reported that, at 6–7 years post partum, the higher prevalence of ultrasound-diagnosed non-alcoholic fatty liver disease that they observed in 110 women with previous GDM compared with those without such a history (38% vs 17%) was associated with concomitant glucose intolerance. In contrast, whereas Foghsgaard et al 12 also reported a high prevalence of ultrasound-diagnosed fatty liver in 100 women with previous GDM compared with 11 controls at ~5 years post partum, they found that its presence did not relate to glucose intolerance. In considering these conflicting data, it should be recognized that limitations of the previous studies have included (1) modest sample sizes, (2) binary classification of preceding gestational glucose tolerance as GDM versus non-GDM (ie, without accounting for the potential heterogeneity of the non-GDM group, as reflected in the metabolic implications of GIGT), (3) binary classification of hepatic steatosis by either the presence or absence thereof, and (4) varying degrees of adjustment for potential confounders. Thus, recognizing these limitations, our objective in this study was to evaluate the graded associations of liver fat with glucose homeostasis in a well-characterized cohort of women reflecting the full spectrum of gestational glucose tolerance in their recent pregnancy (from normal to GIGT, to GDM). This study was conducted in the setting of an observational cohort in which women are recruited at the time of antepartum screening for GDM to undergo prospective cardiometabolic characterization during pregnancy and in the postpartum years thereafter. The cohort protocol has been previously described in detail.14 In brief, all pregnant women at our institution are screened for GDM at 24–28 weeks’ gestation by 50 g glucose challenge test (GCT), followed by a diagnostic oral glucose tolerance test (OGTT) if the GCT result is abnormal (defined as plasma glucose ≥7.8 mmol/L at 1-hour postchallenge). For this cohort, healthy pregnant women were recruited either prior to or just after their GCT. Regardless of the GCT result, all study participants completed a 3-hour 100 g OGTT, enabling classification of their gestational glucose tolerance status as GDM, GIGT, or normal glucose tolerance (NGT). GDM was defined by the National Diabetes Data Group criteria, which require at least two of the following on the OGTT: fasting blood glucose ≥5.8 mmol/L, 1-hour glucose ≥10.6 mmol/L, 2-hour glucose ≥9.2 mmol/L, or 3-hour glucose ≥8.1 mmol/L. GIGT was defined by meeting only one of these glycemic thresholds. As previously described,14 the recruitment of women following an abnormal GCT served to enrich the study population for those with gestational dysglycemia. In the postpartum years, the participants returned to the clinical investigation unit for reassessment, including 2-hour 75 g OGTT. The current analysis was performed in those women who consented to undergo hepatic ultrasound to assess their liver fat status (n=257). These participants did not differ from the rest of the cohort with respect to diabetes risk factors of ethnicity, family history of diabetes or body mass index (BMI), but were slightly older (median age 35.0 vs 34.0 years, p=0.02). All participants have provided written informed consent. At postpartum assessments, interviewer-administered questionnaires were completed (including Baecke Physical Activity15) and physical examination was performed, including measurement of blood pressure, weight, and waist circumference, as previously described.14 All study visits were performed in the morning after overnight fast and included a 2-hour 75 g OGTT, on which current glucose tolerance status was defined according to current Canadian Diabetes Association guidelines.16 Pre-diabetes refers to impaired glucose tolerance, impaired fasting glucose, or combined impaired glucose tolerance and impaired fasting glucose. Participants underwent hepatic ultrasonographic examination that was performed with a standard clinical ultrasound machine (Toshiba Medical Systems) by an operator who was blinded to preceding gestational and current glucose tolerance. For this examination, a series of standardized images of the liver were obtained in the axial and sagittal planes and reviewed by a single radiologist with subspecialty expertise in abdominal imaging (MM), who was blinded to the clinical history and glucose tolerance of the participants (both gestational and current). Liver fat was graded on the ultrasonographic images using an established 4-point scoring system22–24 that yields the following classifications: (1) no fatty infiltration (liver fat score=0); (2) mild fatty liver (score=1); (3) moderate fatty liver (score=2); or (4) severe fatty liver (score=3). All analyses were conducted using SAS V.9.2. The study population was stratified into the following three groups based on liver fat grading: (1) fat score 0, (2) fat score 1, and (3) fat score ≥2. The demographic, clinical and metabolic characteristics of the three groups were compared by Kruskal-Wallis test for continuous variables, or either χ2 or Fisher’s exact test for categorical variables (table 1). Continuous variables were tested for normality of distribution, and natural log transformations of skewed variables were used, where necessary, in subsequent analyses. The prevalence of the liver fat strata (0, 1, ≥2) was compared by gestational glucose tolerance group in the recent pregnancy (NGT, GIGT and GDM in figure 1A), by current glucose tolerance status (NGT and pre-diabetes/diabetes in figure 1B), and by both gestational and current glucose tolerance groups (NGT in pregnancy, GIGT in pregnancy, GDM with current NGT and GDM with current pre-diabetes/diabetes in figure 1C), respectively, using either χ2 or Fisher’s exact test. 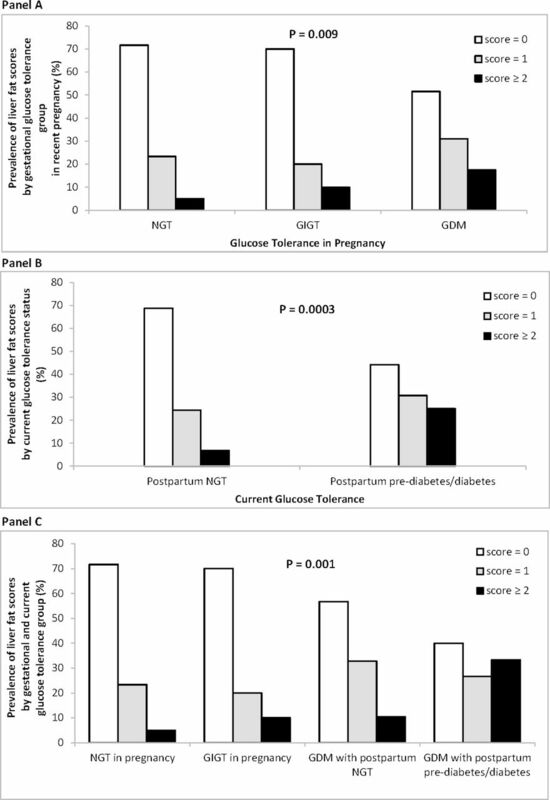 Prevalence of liver fat scores (0, 1, or ≥2) by (A) gestational glucose tolerance group in recent pregnancy, (B) by current glucose tolerance status, and (C) by gestational glucose tolerance and current glucose tolerance, respectively. P values refer to overall comparison across the groups. GDM, gestational diabetes mellitus; GIGT, gestational impaired glucose tolerance; NGT, normal glucose tolerance. Multiple linear regression analyses (table 2) were performed to determine whether categorical liver fat score was an independent predictor of the following metabolic outcomes: insulin sensitivity/resistance (Matsuda Index and HOMA-IR), beta-cell function (ISSI-2 and Insulinogenic Index/HOMA-IR), and glycemia (fasting glucose and 2-hour glucose). For each of these metabolic outcomes, model 1 was adjusted for clinical risk factors for diabetes (age, ethnicity, family history of diabetes, BMI). The subsequent models were further adjusted for duration of breast feeding in the first year post partum (model 2) and gestational glucose tolerance status in the recent pregnancy (model 3). Lastly, logistic regression analysis was performed to evaluate whether the categorical liver fat score was an independent predictor of current pre-diabetes/diabetes (figure 2). This model is adjusted for the same covariates as in the fully adjusted model 3 of the multiple linear regression analyses. To compare the relative importance of the predictors, the continuous covariates were standardized and their ORs per SD change are presented. Logistic regression analysis of (dependent variable) pre-diabetes/diabetes. BMI, body mass index; DM, diabetes mellitus; GDM, gestational diabetes mellitus; GIGT, gestational impaired glucose tolerance; NGT, normal glucose tolerance. The antepartum OGTT at recruitment showed that the 257 study participants reflected three strata of gestational glucose tolerance: antepartum NGT (n=120), GIGT (n=40), and GDM (n=97). At the repeat OGTT at a mean of 4.8 years post partum, 205 women had NGT and 52 women had dysglycemia, the vast majority of which (80.8%) was pre-diabetes. The liver ultrasound enabled stratification of the study population into three groups based on the severity of hepatic steatosis: (1) women with no hepatic fat (fat score=0) (n=164), (2) women with mild liver fat (score=1) (n=66), and (3) those with moderate or more liver fat (score ≥2) (n=27, of whom 25 had score=2). To identify clinical and metabolic associations of liver fat, we first compared the characteristics of these three groups (table 1). These groups did not differ in age, ethnicity, family history of diabetes, smoking, or physical activity. However, they exhibited marked metabolic differences. Specifically, in moving across the liver fat groups from none to mild to moderate, there was a stepwise increase in BMI, waist circumference, ALT, and GGT (all p≤0.0007), along with a greater likelihood of having a history of GDM prior to the index pregnancy (p=0.02) and a shorter duration of breast feeding (p=0.03). These differences were coupled with poorer insulin sensitivity/resistance (Matsuda Index, HOMA-IR; both p<0.0001), worsening beta-cell function (ISSI-2, Insulinogenic Index/HOMA-IR; both p≤0.009), and rising glycemia (fasting glucose, 2-hour glucose; both p<0.0001). Thus, the severity of liver fat tracked with metabolic status and determinants of glucose homeostasis (insulin sensitivity/resistance and beta-cell function). We next evaluated the relationships of liver fat with gestational glucose tolerance in the preceding pregnancy and current glucose tolerance status, respectively. Hepatic fat was more prevalent in women with previous GDM than in those with a history of GIGT or antepartum NGT (p=0.009) (figure 1A). It was also more prevalent in women who currently had pre-diabetes/diabetes than in those with current NGT (p=0.0003) (figure 1B). Finally, we considered the impact of current pre-diabetes/diabetes on the relationship between previous GDM and liver fat. Notably, the severity of hepatic fat progressively decreased from women with previous GDM and current pre-diabetes/diabetes to those with previous GDM/current NGT, to previous GIGT, to those with a history of antepartum NGT (p=0.001) (figure 1C). It thus emerges that liver fat may be associated with GDM and subsequent pre-diabetes/diabetes. To evaluate how hepatic fat may have such an impact, we next performed a series of multiple linear regression analyses (table 2) to determine whether hepatic fat was independently associated with the following metabolic outcomes: (1) Matsuda Index, (2) HOMA-IR, (3) ISSI-2, (4) Insulinogenic Index/HOMA-IR, (5) fasting glucose, and (6) 2-hour glucose. After adjustment for age, ethnicity, family history of diabetes, BMI, duration of breast feeding, and previous gestational glucose tolerance status, liver fat score ≥2 was independently associated with lower Matsuda Index (p=0.0002) and higher HOMA-IR (p=0.003). In contrast to these relationships with insulin sensitivity/resistance, hepatic fat was not associated with either measure of beta-cell function (ISSI-2 and Insulinogenic Index/HOMA-IR). Notably, liver fat score ≥2 was independently associated with higher 2-hour glucose (p=0.009) but not with fasting glucose. Thus, greater hepatic fat was associated with poorer insulin sensitivity and higher postchallenge glycemia. We also performed a series of sensitivity analyses to evaluate the robustness of these observations. First, the findings were unchanged when the analyses were restricted to women with no history of GDM prior to the index pregnancy (data not shown). Second, for each metabolic outcome in table 2, the findings were unchanged on further adjustment for an intervening pregnancy between the index pregnancy and the liver ultrasound (which occurred in 61 women) (data not shown). Finally, on adjustment for area under the glucose curve on the OGTT in the index pregnancy (rather than categorical gestational glucose tolerance), the findings were largely unchanged, although the association of liver fat score ≥2 with 2-hour glucose was now at borderline significance (p=0.07) (data not shown). Lastly, we performed logistic regression analysis to determine if liver fat was independently associated with current glucose intolerance in this population. In a model that included diabetes risk factors (age, ethnicity, family history of diabetes, BMI, duration of breast feeding) and gestational glucose tolerance status, liver fat score ≥2 emerged as an independent predictor of pre-diabetes/diabetes (OR=3.66, 95% CI 1.1 to 12.5, p=0.04). Of note, GDM and GIGT were also significant independent predictors of pre-diabetes/diabetes, with ORs at similar magnitude as liver fat score ≥2. In this study, we demonstrate that the spectrum of glucose intolerance in pregnancy is associated with a gradient in the severity of hepatic steatosis, such that women with recent GDM ‎have a higher prevalence of fatty liver at ~5 years post partum than their peers. Second, we show that greater hepatic fat is independently associated with poorer insulin sensitivity and higher 2-hour postchallenge glucose, after adjustment for risk factors for diabetes and preceding gestational glucose tolerance. Third, and most importantly, fatty liver is an independent predictor of pre-diabetes/diabetes in this patient population. It thus emerges that the higher prevalence of liver fat in women with previous GDM is associated with their increased risk of pre-diabetes/diabetes. While recent studies have reported that women with a history of GDM have an increased prevalence of fatty liver disease,10–13 they have yielded conflicting findings on whether liver fat relates to the risk of pre-diabetes/diabetes in this patient population. Importantly, these studies have been variously limited by modest sample sizes, varying degrees of adjustment for potential confounders, and binary classification of both the exposure (presence vs absence of previous GDM) and outcome (presence vs absence of non-alcoholic fatty liver disease). The current study was thus designed to address these limitations. First, the prospective ascertainment of glucose tolerance in pregnancy was designed to yield a study population reflecting the full spectrum of gestational dysglycemia (from normal to GIGT, to GDM) and hence a broad range of future diabetic risk against which to evaluate the metabolic impact of liver fat content. Second, the scoring of liver fat enabled evaluation of its severity and the graded metabolic implications thereof. Third, besides representing a larger sample size than previous studies, this study population underwent detailed metabolic characterization with measurement of glucose tolerance, insulin sensitivity, and beta-cell function, thereby enabling evaluation of the independent associations of liver fat with glucose homeostasis and its physiologic determinants. Supported by these design features, the current study demonstrates that almost one in two women with previous GDM show evidence of fatty infiltration of the liver (with 30.9% having mild fatty liver and 17.5% graded as moderate or more) at a mean of 4.8 years post partum, in marked contrast to their peers who maintained NGT in pregnancy. We further show that the severity of fatty infiltration has implications for current metabolic status, with fat score 1 and ≥2 both independently associated with progressively lower whole-body insulin sensitivity (table 2A). These data are in agreement with earlier studies linking fatty liver with insulin resistance in women with previous GDM,11 12 25 while extending this literature in three ways. First, it is apparent that a graded relationship exists between the degree of hepatic steatosis and insulin sensitivity. Second, the sequential multiple linear regression analyses (table 2) show that these associations are independent of diabetes risk factors and even previous gestational glucose tolerance. Third, we demonstrate that moderate fatty liver independently predicts both 2-hour glucose and the risk of pre-diabetes/diabetes, after adjustment for the same covariates. Coupled with these earlier observations, our data support the concept that fat deposition in the liver is a determinant of diabetic risk in women with previous GDM. Of note, when assessed after 25 years follow-up in the Coronary Artery Risk Development in Young Adults cohort, 124 women with self-reported GDM had a higher prevalence of fatty liver in middle age than did their peers, but this relationship was attenuated on adjustment for incident diabetes.13 In this regard, our stratification of women by both preceding antepartum glucose tolerance and current glucose tolerance is revealing (figure 1C). Specifically, while fatty liver was most prevalent in women with previous GDM who had pre-diabetes/diabetes at ~5 years post partum, women with GDM who maintained NGT still had a higher prevalence of liver fat than did those with either GIGT or NGT in pregnancy. These data suggest that, in women with GDM, fatty liver is not entirely dependent on the development of glucose intolerance. Consistent with this observation, ultrasound identification of liver fat in early pregnancy has been shown to predict subsequent gestational dysglycemia, suggesting that hepatic steatosis may precede the development of GDM itself.29 Finally, it should be noted that our logistic regression analyses revealed that, while fatty liver was an independent predictor of pre-diabetes/diabetes after adjustment for diabetes risk factors and previous gestational glucose tolerance status, both GDM and GIGT remained significant predictors of this outcome as well. It thus emerges that liver fat does not fully account for the elevated diabetic risk of women with previous gestational dysglycemia. Rather, these data suggest that it is one of the factors contributing to diabetic risk in this population, possibly by reflecting the burden of ectopic fat deposition. A limitation of this study is that fatty infiltration of the liver prior to the index pregnancy was not assessed, such that we cannot exclude that the possibility that the observed hepatic fat may have preceded the pregnancy. Second, liver biopsy is the gold standard for assessing liver fat, such that the application of ultrasonography for this purpose is a limitation of this study. However, because liver biopsy would not be feasible in this population of healthy young women for both ethical and practical reasons, ultrasound has been the typical modality of assessment in this literature.11 12 Furthermore, the ultrasound protocol in this study was sufficiently sensitive to reveal the graded associations between the severity of liver fat and metabolic function. In light of the observed association between liver fat and glucose homeostasis in the first 5 years after GDM, future studies should focus on longitudinal evaluation of the temporal relationships between these features over time in this population. In conclusion, the spectrum of glucose intolerance in pregnancy is associated with a gradient in the severity of hepatic steatosis at ~5 years post partum, as reflected in the high prevalence of fatty liver in women who had GDM. Fatty liver is independently associated with poorer insulin sensitivity and higher 2-hour postchallenge glucose, after adjustment for diabetes risk factors and preceding gestational glucose tolerance. Most importantly, fatty liver is an independent predictor of postpartum dysglycemia in this patient population. Thus, the higher prevalence of liver fat in women with previous GDM is associated with their increased risk of pre-diabetes/diabetes. Canadian Diabetes Association Clinical Practice Guidelines Expert Committee. Canadian Diabetes Association 2013 clinical practice guidelines for the prevention and management of diabetes in Canada. Can J Diabetes 2013;37:S8–S11.
. Prevention of diabetes in women with a history of gestational diabetes: effects of metformin and lifestyle interventions. J Clin Endocrinol Metab 2008;93:4774–9. Contributors SM and RR wrote the first draft. MM interpreted all ultrasound scans. CY and RR designed the analysis plan and CY performed the statistical analyses. MM, LM-B, AJH, PWC, MS, BZ, and RR designed/implemented the study. All authors critically revised the manuscript for important intellectual content. All authors approved the final manuscript. Funding This study was supported by operating grants from the Canadian Diabetes Association (CDA)(CDA-OG-3-15-4924-RR) and Canadian Institutes of Health Research (CIHR)(MOP-84206). LM-B is supported by an Australian National Health and Medical Research Council Fellowship (#605837 and #1078477). AJH holds a Tier-II Canada Research Chair in Diabetes Epidemiology. RR is supported by a Heart and Stroke Foundation of Ontario Mid-Career Investigator Award and holds the Boehringer Ingelheim Chair in Beta-Cell Preservation, Function and Regeneration at Mount Sinai Hospital. RR is guarantor, had full access to all of the data in the study and takes responsibility for the integrity of the data and the accuracy of the data analysis. Ethics approval The liver study protocol has been approved by the Mount Sinai Hospital Research Ethics Board. Data sharing statement Data may be requested from the corresponding author.